With about 30 years of history, NOD32 is the antivirus with the biggest longevity. The first version of NOD32 was launched in 1987 by Peter Paško and Miroslav Trnka, two Slovak developers. Five years later, in 1992, they decided to found a security company named ESET and use it to promote their flagship product: NOD32 Antivirus. Nowadays ESET is one of the biggest Slovak companies, with development teams in two countries and subsidiaries in few other countries. 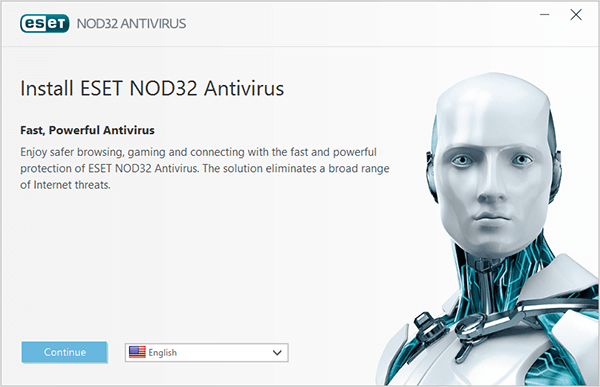 Their NOD32 antivirus is today acknowledged all over the world as a strong and reliable security solution. But enough with this history info, let’s jump to the review of the latest version of NOD32 Antivirus. NOD32 Antivirus 2019 (10.X) is fully compatible with Windows Vista, Home Server, Windows 7, 8, 8.1 and 10 (32-bit or 64-bit version). Attention, the 10.X can’t run on Windows XP. If you need to install ESET NOD32 on a Windows XP machine, you’ll need an older version of it. Three versions of NOD32 (9.x, 8.x, 7.x) are completely compatible with Windows XP Service Pack 3. NOD32 Antivirus is also compatible with Mac (Mac OS X 10.6.x or later), Android (Android 2.3 Gingerbread or later), and Linux. On the hardware area, the system requirements are very similar with the hardware necessary to install other antimalware solutions. If you own a computer with at least 1GHz and 512 MB of RAM you can install and use NOD32 without problems. For Windows Vista, you will need more memory: at least 1 GB of RAM is recommended for a smooth install and use. The installation process is fast and smooth. You’re asked if you want to enable the detection of the potentially unwanted applications (PUA) when the product is downloaded and installed. 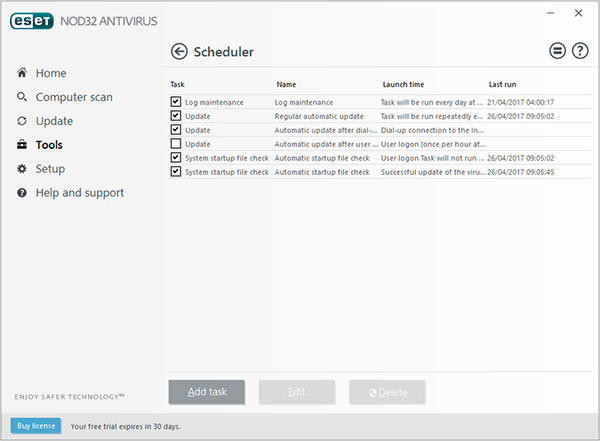 Once activated during the install, the option remains active when the installation of NOD32 Antivirus 2019 is finished. This feature is similar to Malwarebytes Anti-Malware 3.0 installation process. You’re also asked if you want to participate in the ESET LiveGrid feedback system. Basically, some statistics feedback is sent to ESET laboratories, in order to help them improve the product. Overall, the entire process is simple and easy to perform. If you have a license key (username and password), you’ll need to introduce it when the installation process is finished. If you don’t, you can activate the trial version or you go here to purchase a full license. 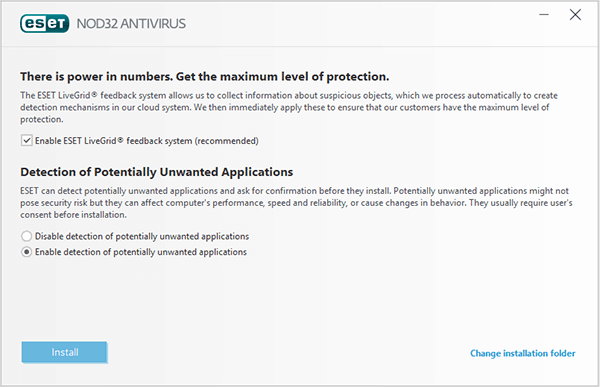 Once we’ve installed the latest version of NOD32 Antivirus it’s time to see what’s ready to offer. NOD32 comes with a series of interesting features. As usual, when we review a product we test it and this is what we’ve got. The protection offered by NOD32 is split into two distinct sections, an area dedicated to computer files, another used for Internet protection. The product is well designed and easy to use, even if you’re not a computer geek. The real time file protection is represented by a top-notch antivirus module. It can be configured in various ways. 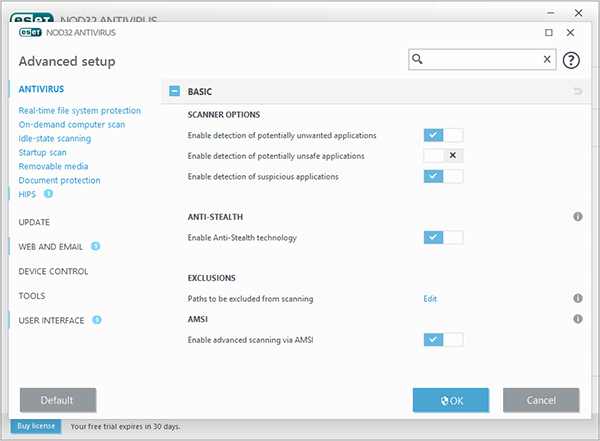 Depending on your needs you can activate/deactivate the ways used by the antivirus to scan the files. The potentially unwanted applications, the unsafe applications, and the suspicious activities can be monitored if the scanner is properly configured. You can enable or disable the anti-stealth technology module, used for rootkits detection. The rootkits are a special type of malware used by cybercriminals to hide various activities performed in the background by other applications. In the tests performed for this review, the latest version of NOD32 Antivirus has worked pretty well. As usual, we’ve checked the reaction speed against the classical EICAR test file and a series of malware files, downloaded from a database. The speed reaction is very good and the antivirus module has worked without any glitch or system freezing. 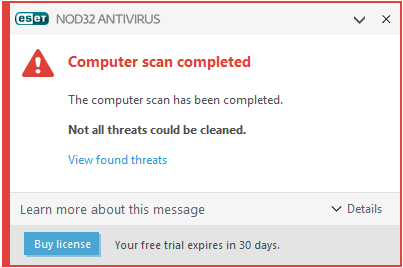 Depending on the infection type, sometimes the antivirus displays a message telling you that some threats can’t be removed. If you’re in this situation, you’ll need to restart the computer in order to completely remove the malware or to move it into quarantine. What we like on NOD32 is its flexibility when you need to decide if a file is malicious or not. These are the default settings of this antivirus. 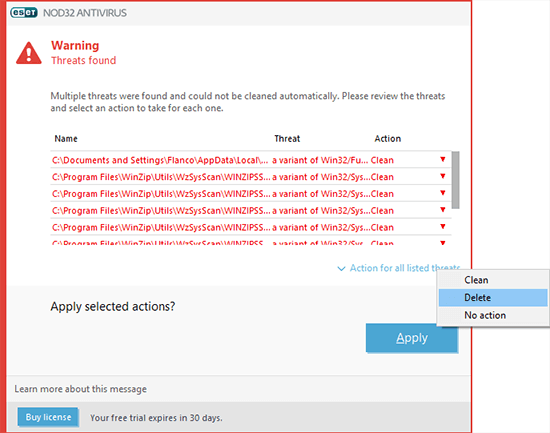 In the screenshot bellow, you can see the options available when an infected file is detected: clean, delete and no action. The real-time file protection from NOD32 is very effective and fast. The only downside could be the impact on the system settings. If you have a good computer with a least 2GB of RAM you can use the latest version of NOD32 without problems. 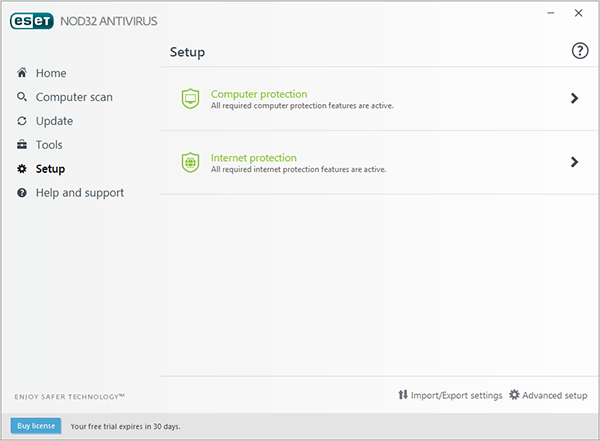 The web access protection module is another feature included in the 2019 version of NOD32 antivirus. The option can be activated or deactivated using Setup > Web access protection. We’ve tested the speed reaction and the effectiveness of this features by visiting a few infected websites. The speed reaction is very good and the infected pages are blocked in a matter of seconds. For this review, we’ve also checked the time of reaction when we used a special tool to visit more than 200 infected pages from various sites in about one minute. Basically, using a script the computer visits the infected pages from a predetermined list. The test result was extremely good and all the pages were blocked. The only downside in this test was the number of popups displayed when the antivirus reacted, but you’ll never really see this on your computer. The HIPS (Host Intrusion Prevention System) technology is used by NOD32 in a very effective way. 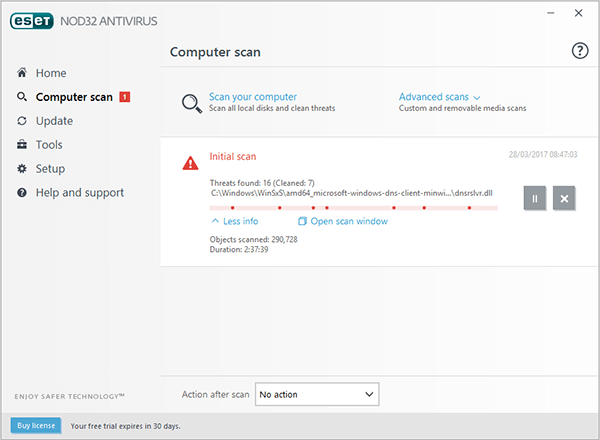 It works in a similar manner with another tool reviewed by our team: Malwarebytes Anti-Malware 2019. Basically, this module can monitor any unusual behavior of the already installed applications. This feature can prevent the infection with malware activated on the computer after a longer period of time. To activate HIPS you need to go to Setup > Computer protection > Activate Host Intrusion Prevention System (HIPS). The antiphishing protection works remarkably well. This version of NOD32 was improved and the detection rate is now very impressive. The module warns you about the phishing pages and blocks them in a very effective way. If you’re concerned about the danger of online payments, NOD32 2019 can help. The email protection scanner is another interesting tool, integrated into the main core of NOD32. The scanner checks the incoming emails for threats, malware, viruses, trojan horses, and spyware. The tool is fully compatible with the most important email clients: Windows Mail, Mozilla Thunderbird, Outlook, Outlook Express and Windows Live Mail. The integration is simple and fast: a plugin is integrated into the email client. When a new email is received, the tool checks its content then decides if is dangerous or not. If the email is fishy or contains something dangerous, the message is blocked and automatically moved into the quarantine. The email protection was very effective in the tests performed for this review. We were impressed by its speed and capability to stop dangerous emails. Compared with the last year’s version, NOD32 comes with a few new or improved features. All of them are accessible using the Tools option from the main menu of the antivirus. Now, let’s see what these tools can do for your computer protection. The Activity watcher is a module which provides advanced statistics about the files system activity. You can have a look at the resources consumed by applications or you can check the amount of data written on the hard drive. The tool is useful because you can see the resources burned by the system or you can identify any malicious software running in the background. The Running processes module watcher is very similar to the tool described below. However, the difference between these features is the level of information provided by the second tool. The idea behind NOD32’s running processes module is to offer an advanced tool to the applications active on the background. The module shows the level of risk, the process ID, the number of users and the application name. Because the application name can’t be faked by the hackers, you can spot with ease any unusual application installed on your computer without your consent. These statistics can be accessed using the Tools menu then Running processes. The Scheduler is another tool integrated into the latest version of NOD32. You allows you to setup various intervals of time to run the tasks and you can also add customized jobs. This feature is very useful if you need to perform tasks when the computer runs but you don’t work on it. An example could be a full scan running after you finish the work at the job and go home. 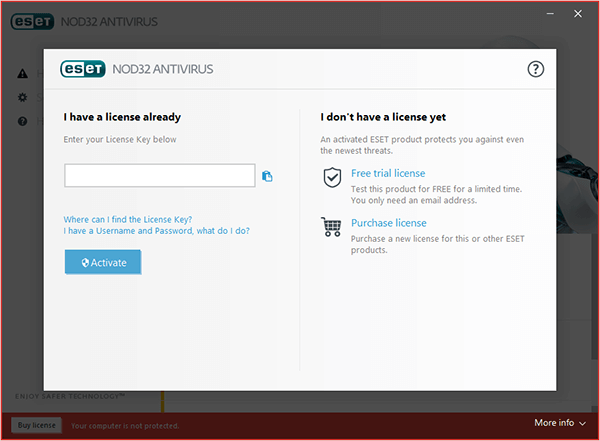 The Reporting tool is basically a place where you can find some statistics data about the usage of NOD32 Antivirus. In a single screen, you can see how many objects have been scanned and how many of them are dangerous. The design is simple and easy to understand, even if you’re not a computer expert. 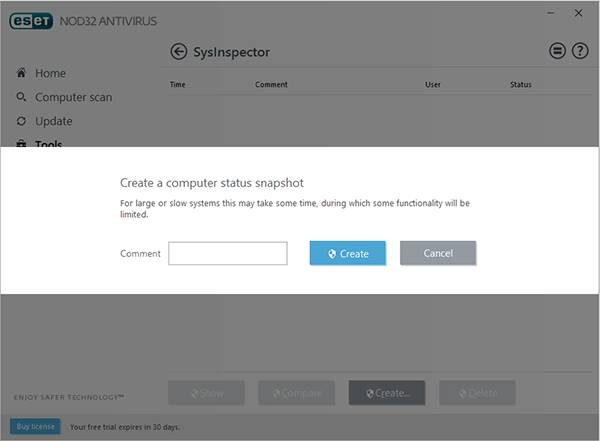 SysInspector is a module developed by ESET which provides advanced data about the software and hardware of the machine where the antivirus is installed. You can create snapshots with information, useful if you want to dig more into the system. ESET SysRescue Live is one of the best functionalities included in NOD32 Antivirus 2019. This tool is dedicated to the persistent malware which can’t be removed using the real-time scanner module. 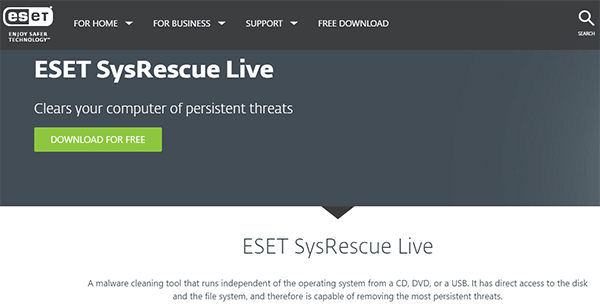 ESET SysRescue Live runs separately from the computer and doesn’t need the installation. If you want to run it, you need to use a CD, DVD or a USB stick. We’ve tested ESET SysRescue Live to see if it is efficient and discovered that this is one of the best tools for systems compromised by malware. You’ll need to restart the computer then run the tool directly from the external medium. In a matter of minutes, the most persistent threats will be removed. 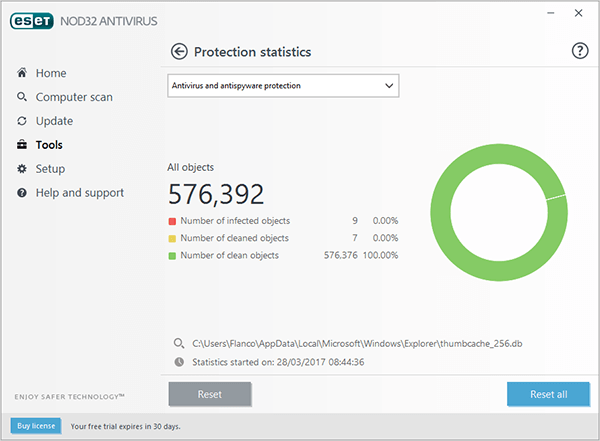 It was a pleasure to see how a few extremely dangerous viruses were removed from a computer used for tests after we used ESET SysRescue Live. The Quarantine is the place where NOD32 moves the infected files, the malware or the suspicious files. If you think a file is quarantined by mistake you can restore it. Make sure you know what you’re doing if you decide to ignore NOD32 warnings. The false positives alerts are extremely rare. If a file is moved by NOD32 Antivirus, most likely it is infected and should be deleted permanently. In the test performed for this review, NOD32 effectiveness was very good. The only downside we’ve remarked is the resources consumed when a scan is running. The latest version of NOD32 doesn’t slow down the computer speed when running in the background. The impact on speed is only visible when you need to perform a custom scan. If you have at least 2GB of memory installed on your computer, you can install and use NOD32 without any noticeable impact on speed. As usual, for this review, we’ve tested the reaction speed of the support team and the data provided by ESET to their users. NOD32 comes with access to a great database with info about malware, viruses, threats and methods to solve the problems if you’re infected. You can have a look at this knowledgebase using the Help and support menu, directly from NOD32’s interface. You’ll also have access to a threat encyclopedia and various support tools. We’ve tested the reaction speed of the support team and their expertise in the malware removal. The conclusion: their support team is very fast, kind and professional. NOD32 comes with a good price for the features offered. You can purchase a license for one year at a price of $39.99 and you can benefit from 30% discount if you buy a license for two years. The Mac version can be purchased at the same price here.You can receive a $20 discount if you decide to purchase a complete antivirus protection for two years. Both offers are very good for the protection received by the computer. The biggest independent antivirus testing laboratories recognize the effectiveness and the quality offered by ESET products. The prizes received by NOD32 from Virus Bulletin and AV-Test.org confirm the conclusion of our review: the 2019 version is a top notch solution for protection against malware and threats. ESET offers a few solutions adapted to the main operating systems of the moment. For Windows, we have three options which provide various level of protection: NOD32 Antivirus (which provides basic protection), ESET Internet Security (which offers Advanced Internet Security), and ESET Smart Security Premium (which provides Premium Internet Security). The prices vary from $39.99 to $79.99 depending on the level of protection provided. For Mac users, we have three options: ESET Cyber Security (basic antivirus protection for Mac), ESET Cyber Security Pro (which offers advanced internet security for Mac) and ESET Internet Security (which provides complete internet security). For Linux and Android, you’ll find on this page more details about the security solutions available for these operating systems. A parental control solution is also available for Android users. 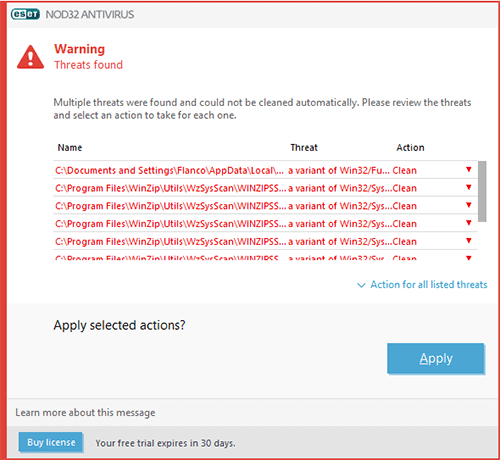 NOD32 Antivirus 2019 is a top-notch solution for malware protection. Below you’ll find the main pros and cons of this security suite. At the end of this review, we have a simple conclusion for you: NOD32 is one of the best antivirus solutions of the moment. You’ll make no mistake if you decide to trust this ESET solution to protect your devices against unwanted viruses and threats. ESET NOD32 Antivirus 2019 is a top-notch solution against malware and online threats. 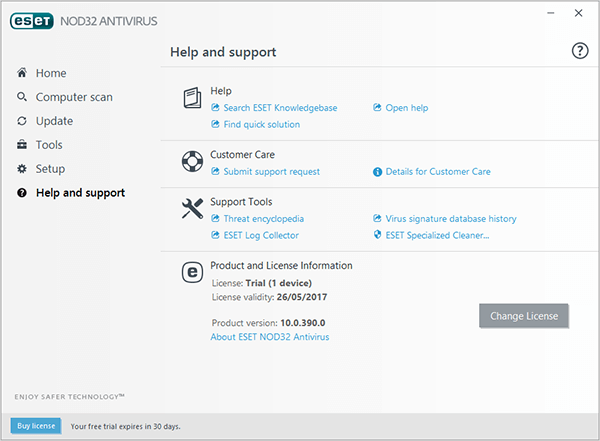 At the moment ESET offers a few discounts for all its security products, including for NOD32 Antivirus 2019. Visit this page and benefit from up to a $40 discount. The last several years have seen a spectacular increase in cyber threats worldwide, with huge data and financial loss being reported. Make sure you don’t end up their next victim. Install and use the latest version of ESET NOD32 Antivirus.